$15 each. 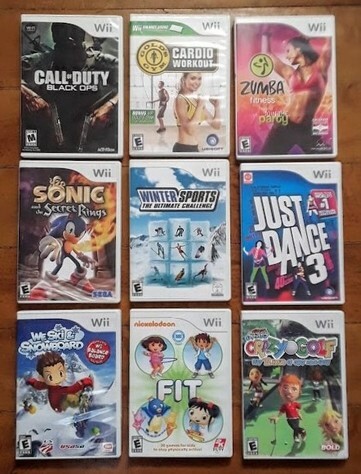 Call of Duty Black Ops, Gold's Gym Cardio Workout, Zumba Fitness ($10 for belt), Sonic and the Secret Rings, Winter Sports The Ultimate Challenge, Just Dance 3, We Ski and Snowboard, Nickelodeon Fit, Kids Sports Crazy Golf. I also have a NEW Call of Duty Black Ops Headbanger Chat Headset for $40 in another listing.